But this was just the beginning, as the business existed for almost 100 years before Röda Lacket was registered as a brand. Meanwhile, Petter Swartz and his brother Olof (who had joined the business) became successful businessmen. While the Swartz family business grew to giant proportions, their secret were seven proprietary snus recipes. One of those served as the basis for a brand registered in 1897 – Röda Lacket. When the Swedish government monopolized snus production in 1915, the Swartz snus factory didn’t get spared. Though the big production volume slowed down the process of incorporating the seven family recipes into centralized snus production, the monopoly eventually swallowed the family business. 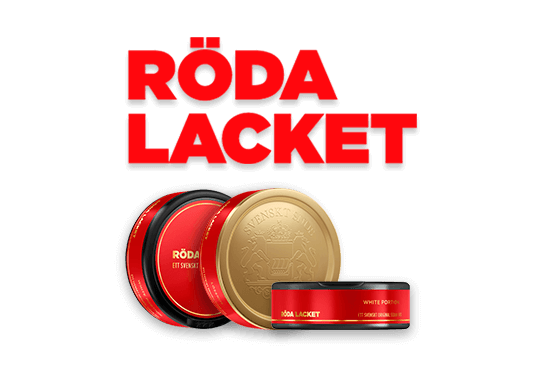 As a popular snus, however, the Röda Lacket recipe was preserved even throughout the monopoly, allowing the brand to survive until today. The words Röda Lacket are (obviously) Swedish and roughly translate to „red paint“, clearly hinting at the color of the can. What seems like an irrelevant fact would become important in the late 1960s. The decade of the Beatles, Bob Dylan and anti-war protests blessed Röda Lacket with a boom, as the snus became popular with young student activists. Today, the brand is owned by tobacco manufacturer Swedish Match – and they stay true to the tradition. Röda Lacket tastes almost the same today as it did a hundred years ago (slight adaptations to the recipe have been made in 2006). Today, Röda Lacket is known as a traditional snus which has seen the tides of time come and go. From innovating the can to the turbulent 60s to today, Röda Lacket has seen it all. 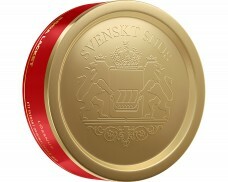 For over 100 years now, the snus has been known not only for its flavor, but also for its design. The can’s looks are constantly changing. In a campaign in 2006, manufacturer Swedish Match has even released 21 different designs in one year. While the design constantly changes, the snus hasn’t changed much. It’s still known for its perfect consistency, making it easy for snus lovers to grab a pinch and place it in their mouth. The taste is a dark tobacco flavor, enhanced by sweet hints of dried fruit and slight hints of smoke. 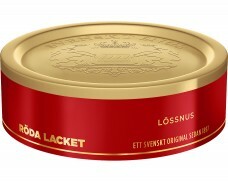 As a traditional brand, Röda Lacket is only available as loose snus, like it was a hundred years ago.